In my experience, if we are to be successful, then leaders in our field need to work alongside lawmakers and governing agencies to develop realistic, common-sense approaches to conservation in tandem. 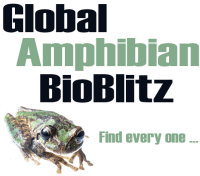 I began my career with amphibians as a zoo keeper in the late 1980s when scientists were mobilizing on a global scale to determine causes for increased declines of amphibians. Early on, “red-leg” was a common term pegged for immunosuppressed amphibians whose suspected cause of demise were unknown stressors or environmental toxins, rather than a pathogenic disease later identified as the amphibian fungus, Batrachochytrium dendrobatidis. Also during that time very little was known about captive husbandry requirements and medical treatments for amphibians. 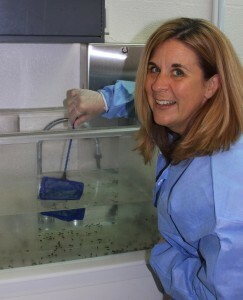 As a young, enthusiastic keeper, I quickly immersed myself in everything amphibian to learn more about them, provide better care for the animals in my charge and to help solve the mystery of their declines. Diane Barber remains confident that our future includes wild places for humans to coexist with amphibians, learn from them and continue to witness first-hand their amazing adaptations for life. In 1993, I was asked to assist with the last remaining Wyoming Toads which had been pulled from the wild in a last ditch effort to save them from extinction, and later released first-generation offspring back to Laramie, beginning reintroduction efforts for this species. I will never forget the sensation of happening upon an adult Wyoming Toad peering up at me from a pond, years after it was first released as a tadpole under my care. From then on my enthusiasm towards amphibian conservation grew two-fold, and as my former director said, “started a fire in my belly” which has never been extinguished (although I do take anti-acids on seemingly increased occasions to subdue the burn). I currently have the privilege of working with several reintroduction programs for endangered amphibian species including the Houston Toad and Chiricahua Leopard Frog. I also serve as the Coordinator for the Puerto Rican Crested Toad Species Survival Plan and am actively involved in all aspects of its recovery. Although reintroduction programs can be rewarding, current and emerging threats, lack of resources, political challenges and changing landscapes can lead to major hurdles, reducing momentum and optimism for all involved. Despite these hurdles and the seemingly snail-like pace of the “race” to halt extinction, this remains the most rewarding part of my job and I enjoy sharing my successes and failures for the benefit of others. 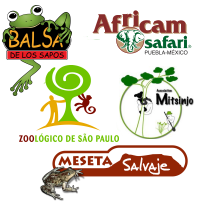 I have acted as chair of the Association of Zoos and Aquarium’s Amphibian TAG since 2006 and serve on various working groups including IUCN Amphibian Specialist Group. As more species are identified for immediate conservation actions, space and resources continue to decline and the need for a holistic approach to species prioritization and allocation of resources, at the global level, from the top-down, rises. In my experience, if we are to be successful, then leaders in our field need to work alongside lawmakers and governing agencies to develop realistic, common-sense approaches to conservation in tandem. Many of the people I have met or worked with over the past thirty years have served as extraordinary models of inspiration – often reminding me that individuals CAN make a huge difference when they are passionate and empowered to effectively do their jobs. Amphibian husbandry and medical practices have improved since I was a zoo keeper, but there is still so much to learn about the 6,000-plus species that remain today. Hopefully, these unknowns will continue to peak interests and create more amphibian stewards who can center efforts globally, as I remain confident that our future includes wild places for humans to coexist with amphibians, learn from them and continue to witness first-hand their amazing adaptations for life.